Dr. Kate Snyder is an associate professor of Educational Psychology, Measurement, and Evaluation at the University of Louisville. In her research program, she focuses on the role of achievement motivation in the development of academic underachievement, especially among gifted students. Kate also teaches graduate level courses in educational psychology and human development. Outside of academia, she trains with Laura Burket of Battle Creek Dressage. You can find her tweeting about all things educational psychology and equestrian at @DressageProf. When I’m not busy being a professor, I can be found at the barn with my nine year old Thoroughbred horse (Chance). Chance was bred to be a racehorse but he was too slow, so he opted for a career change. He is now enjoying his new life as my dressage horse. Four years after I adopted him, we are now at the level of dressage training where things are new to both of us. I have found the learning strategies to be incredibly helpful in tackling our dressage education. Before I can share how I’ve used spaced retrieval practice, dual-coding, and elaboration in dressage, I need to explain what dressage is. Our classroom is a rectangular arena (20m by 60m) with letters. We enter at “A” and a judge sits at “C.” Riders perform their test for the judge with no outside assistance. This summer, Chance and I worked on preparing for Second Level Test 1 (https://files.usef.org/assets/UwyvaI2p-e0/2015secondleveltest1.pdf) and Second Level Test 3 (https://files.usef.org/assets/0CNEEuguQ2k/2015secondleveltest3.pdf.pdf). My goal was to thoroughly memorize my tests so that I could focus on actually riding during the tests, rather than spending precious working memory to recall the movements. In this article I focus on how I use four of the six learning strategies to accomplish this: spacing and retrieval practice, dual-coding, and elaboration. There is always the temptation to just re-read my test pattern or re-ride it in order to learn it, but that will only give me a false sense of competence. Instead, I recall the test from memory (retrieval practice) over time (spacing). I don’t worry too much about an exact degree of spacing. Any spacing seems to work pretty well (1), so I just aim to forget a bit before retrieving again. My commute to the barn is a great opportunity to engage in retrieval practice. Can I recall the test movements from memory? I quiz myself on the movements as a checklist (enter at A, track left, medium trot, shoulder-in…). Can I recall the test movements along with how I need to ride it effectively? What am I doing at each movement? How am I preparing myself for the next movement? What does each moment look like and feel like? What does it look like to ride this at home, or at a particular competition ring? Can I pick a random spot in the test and recall the remainder? I also ride the test from memory, but not too often. Research with rats suggests that spaced retrieval is a general principle of memory across species (2), and Thoroughbreds are pretty smart. Chance frequently picks up on familiar patterns and tries to anticipate the movements. When I practice riding the tests with him, I ride portions of the test (another way to engage in retrieval practice) or mix up the places in the arena that I practice certain movements. Test movements require correct geometry. I focus a lot on accurate geometry because I cannot afford to sacrifice those points. Movements 20 and 24 in Second Level Test 3 are a three-loop-serpentine. These serpentines have a “2” in the coefficient column, which means that the scores on these movements count double. It is worth a bit of dual-coding effort to invest in these movements! USDF has a lot of helpful articles that diagram out geometry, like this one (https://www.usdf.org/EduDocs/Competition/Geometry_Class.pdf) (3). This helps me to pair the image of a correct serpentine with “serpentine” in my mind. Additionally, I link “serpentine” with the actual visualization of myself riding it accurately in the arena. I sketch out key movements and annotate them. Elaboration is the process of attaching meaning to something. At first glance, the 10 meter circles in Second Level Test 1 (movements #14 and 18) seem random. Ah, but circles support balance. This circle comes before the counter-canter and counter-canter requires balance. 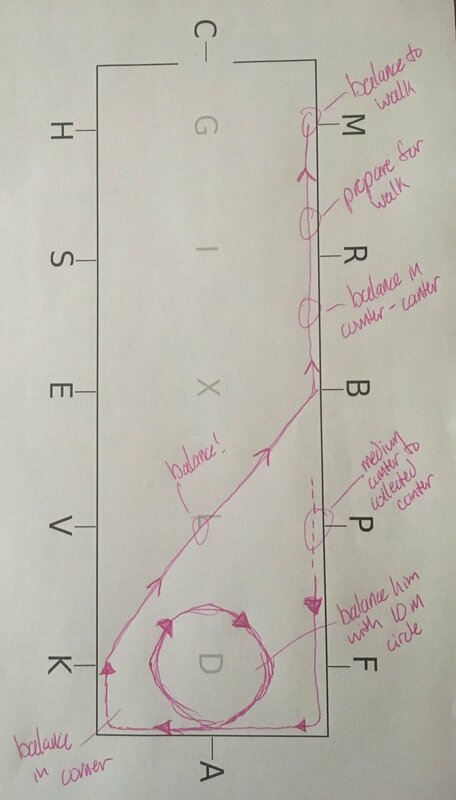 Using elaboration to remember: “Medium canter, then 10m circle to balance for the change rein in counter-canter.” (I’ve used elaboration to remember the circle). Knowing why the movements are included in each test – as well as their order within each test – is an example of elaboration. For example, I read this helpful Practical Horseman article (http://bit.ly/2KdtYfj) that explains how test designers placed longer medium trot and medium canter movements in Second Level Test 3 (as opposed to Second Level Test 1) because it’s more challenging. 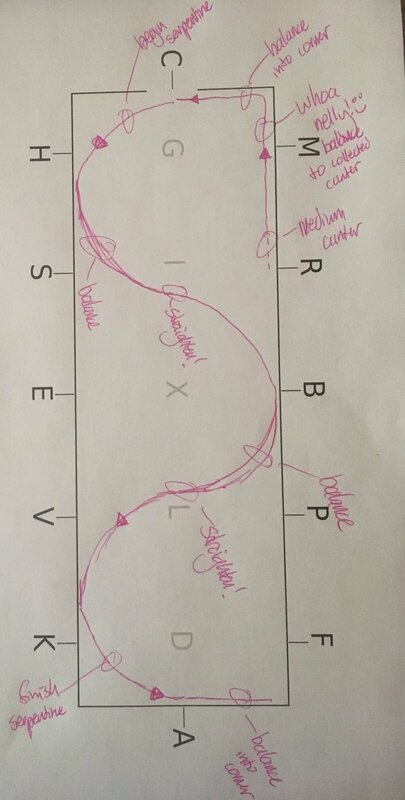 Because I ride both tests on the same day, this helps me remember which test has the full medium diagonal line and which one has the slightly shorter line. Earlier I mentioned the double coefficients – the movements that are double-weighted in scoring. I have found it helpful to look at the movements assigned double coefficients in each test (another way to attach meaning to what I’m memorizing). Why were those movements selected to count double? What does that say about the test itself? Annotating my sketches combines elaboration with dual-coding. If I sketch out the movements from memory, that’s retrieval practice, too! Elaboration pushes me to study each test to figure out how each movement prepares me for the next. Instead of memorizing a seemingly random series of movements, I’m memorizing an interrelated set of movements. The Learning Scientists have done phenomenal work translating cognitive psychology to classroom practice. Indeed, I love using the learning strategies in my teaching. But applying the strategies to my dressage has taken my riding to a whole new level! Fellow researchers and teachers – I would love to see us share more about how we put these strategies into practice in all areas of our lives. (1) Karpicke, J. D., & Bauernschmidt, A. (2011). Spaced retrieval: Absolute spacing enhances learning regardless of relative spacing. Journal of Experimental Psychology: Learning, Memory, and Cognition, 37, 1250-1257. (2) Sisti, H. M., Glass, A. L., & Shors, T. J. (2007). Neurogenesis and the spacing effect: Learning over time enhances memory and the survival of new neurons. Learning & Memory, 14, 368-375. (3) Rowse, K. (2016, September). Geometry Class. USDF Connection, 28-32.